Abstract: With highly developed material growth technology, and GaAs, InP, InAs, InSb, and GaSb substrates being widely available and affordable, III-V semiconductors offer ample opportunities for the development of advanced infrared photodetectors. Traditionally, while HgCdTe (MCT) grown on nearly-lattice-matched CdZnTe (CZT) substrate offers continuous cutoff wavelength coverage from the short-wavelength infrared (SWIR) to the long-wavelength infrared (LWIR) and beyond, detectors based on lattice-matched bulk III-V absorbers are limited to the few SWIR and mid-wavelength infrared (MWIR) cutoff wavelengths offered by InGaAs (on InP substrate), InAs, InAsSb (on GaSb substrate), and InSb. Recent development of metamorphic InAsSb absorbers with higher Sb content allows for continuous cutoff wavelength coverage from MWIR to LWIR, although it requires growth on compositionally graded buffer layers. Alternatively, nearly-lattice-matched or pseudomorphically-grown III-V semiconductor quantum structures such as quantum wells, quantum dots, and type-II superlattices can provide high degree of flexibility in cutoff wavelength range. In addition, III-V semiconductors, particularly the antimonides, offer a highly effective platform for the development of sophisticated heterostructure-based MWIR and LWIR detector architectures, as exemplified by the high-performance double heterstructure (DH), nBn, and XBn. These device architectures exploit the unipolar barrier for reducing dark current generation without impeding photocurrent flow. In this talk we present an overview of recent advances in III-V semiconductor based quantum structure infrared photodetector. 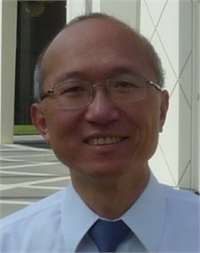 Biography: Dr. David Ting is a Senior Research Scientist, Principal Member of Engineering Staff, and Deputy Director of the Center for Infrared Photodetectors at the NASA Jet Propulsion Laboratory (JPL), California Institute of Technology. He received the B.S. degree (Hons.) in physics from the California Institute of Technology, and the M.S. and Ph.D. degrees in physics from the University of Illinois at Urbana-Champaign. Previously, he was a Senior Research Fellow in the Department of Applied Physics, Caltech, before joining the National Tsing Hua University, Hsinchu, Taiwan, as an Associate Professor of Physics. His research activities have been in the area of semiconductor physics and devices. Since joining JPL in 1998 he has been working on non-magnetic semiconductor spintronics, and quantum well, quantum dot, and type-II superlattice infrared detectors. Results of his work have been reported in over 200 research publications and in over 130 conference presentations and technical seminars. He holds 10 patents. David is a Fellow of the SPIE, and a senior member of the IEEE. He currently serves as the Secretary for the IEEE Metropolitan Los Angeles Section Photonic Society Chapter.